I don't even understand what Light's Judgment does. But there are some interesting cards this round, and I agree about Leatherworking. I'm in that "#1" position again, so...yeah. I'll remain positive for about another hour, and then slide back into my "comfort zone" of self-critical sadness and excessive sighing. That said, i like what my theme inspired all of you guys ! 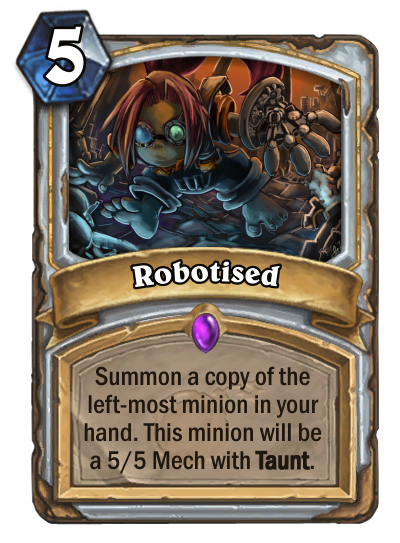 Mecha'Zoth, I really like the substract mechanic, and it's playable so nothing else to say ! Animated statue, neutral that is oriented for some class, maybe too strong in druid but I like it ! Magtheridon, the best one for me, it allows so much possibilities and such a clever design ! Agent-hopper, cool new tool for rogue ! Pushing shuffle mechanic ! Demigorgon, reducing the cost over the time in a clever way (and dangerous one for druid). Well done to everybody, that was a cool week like always ! It costs less mana and does less damage for every minion your opponent controls, meaning it's a Consecration that doesn't damage the opponent when your opponent has 7 minions. Here's the math. 4 mana deal 2 versus 7 minions. 5 mana deal 3 versus 6 minions. 6 mana deal 4 versus 5 minions. 7 mana deal 5 versus 4 minions. 8 mana deal 6 versus 3 minions. 9 mana deal 7 versus 2 minions. 10 mana deal 8 versus 1 minion. 11 mana deal 9 versus 0 minions. I really hope it wins if Leatherworking doesn't win. Thanks for explaining. Although it's very neat idea, I dislike complexity behind it, and I very much like HS because Blizzard pays attention that cards are clear and easy to understand. I will not vote for Light't Judgment for that reason alone (and for some other cards that ended up here in the finals). Simple math is complex to you? After I read through the comments in this final poll, I realized I made my card too OP. I origanally compare his hero power to Bloodreaver Gul'dan so I made 2 of his spells deal 6 and heal 6, because total mana cost is 4, doubled from 2 from Gul'dan. But in the late control game, hero power becomes more powerful, as both players play more for value of their cards instead of tempo. Unlike cards, hero powers can be used repetitively. Blood harvest and Vampiric Thirst would hold off a lot of your opponents minions, plus healing you for 6 each turn. The card also becomes very cheap if you tap a lot, which all warlock does. Honestly, I didn't expect my card to pass to the final poll, as on the last page of submission, Demigorgon and Amplification has like 6 upvotes already when I submitted my entry last night. To be fair, I know this has happened to me before. I had an entry which I thought was balanced, but others pointed out a flaw which made me realise my mistake. Still it happens now and then, you have a good card that just needed some small fixes to make it more balanced. All you can do is hope for the best and learn from the mistake for future competitions. Cheers to all who've appreciated Leatherworking :) good luck to all! Timeless, Demigorgon and Leatherworking looks neat. My vote goes to them, GL to all! Yeah my card would probrably in the last places for this final poll. It's true that all you can do is learn from your mistakes. On another note, you know that entries that are posted earlier in a submission page will have advantages over the entries that are submitted after it in the same page right? The first entry in a page may get some votes even before the later ones are submitted. For solutions, I can only think of locking the upvote until the page is full of 20 entries, or the submission deadline ends. I would just like to point out the issue. Everyone is pretty aware of that. There's no solution as of now. But it's not always the case. Note how Animated Statue got more votes than me on the same page, even though I posted my submission 2 days prior. We ll have the name of the winner in ~10 mins from now. Good luc to everyone! too many 2nd places, ugh :P congrats linkblade! The new theme is ready to go! Congratulations linkblade91! Your card is very cool and interesting and was definitely among the ones deserving to win!